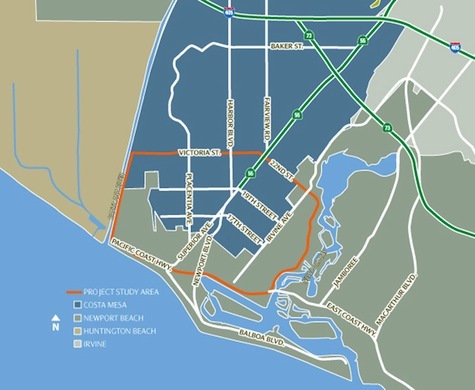 In 2011, the Orange County Transportation Authority (OCTA) initiated a Project Study Report-Project Development Support (PSR-PDS) to analyze transportation improvements related to State Route 55/Newport Boulevard from the end of the freeway at 19th Street and continuing south to Industrial Way. The effort was a continuation of the 2008 SR-55 Access Study, which identified four transportation improvement alternatives. The goal of the study was to analyze the proposed alternatives in greater detail and identify initial scope, schedule, and cost considerations. The PSR-PDS serves as a precursor to the next step in the project development process, which include a full environmental assessment and selection of a locally preferred alternative. Currently, no funding has been identified for this environmental phase. However, by moving this study forward and identifying viable alternatives, the project is ready for development should funding become available in the future. Traffic congestion at the end of the Costa Mesa Freeway is caused by both local and regional commuters. Most SR-55 drivers live in the area or travel there to visit local businesses on or near Newport Boulevard. At the terminus of the Costa Mesa Freeway, at 19th Street, close to 100,000 vehicles pass through this area on a daily basis, and these volumes are projected to grow in the future.